The last 2 Boyd brothers are out to get Baylee, Kit and Quinn. They’ve done their best to ruin Kit and Baylee’s life and now it’s time for them to focus on Quinn. With Conner gone Cade is now the brains of the operation with the help of his brother Collin. They just have to get to Quinn before the man that is hunting them finds them. 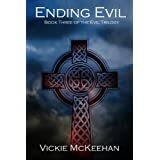 Ending Evil is the last book in the Evil series. The outcome in the final pages is brilliant. Not everything falls together perfectly for the six friends. But that’s what makes the ending great!